Full sun to very light shade. Warm-season annuals, cannot tolerate frost. Mix an organic fertilizer into the soil before planting, using rates given on the label. Supplemental fertilizer seldom required. Plant seeds 2 inches deep and 6 inches apart in late spring, after the last frost has passed and the soil is warm. Install a sturdy trellis before you plant your pole beans. Mulch to keep the soil cool and moist, and to reduce problems with weeds. Gather pods before they fill with seeds. When picked often, pole beans continue to produce all summer. Japanese beetles and Mexican bean beetles sometimes damage leaves and pods. Gather them in broad containers of soapy water in the cool of the morning. 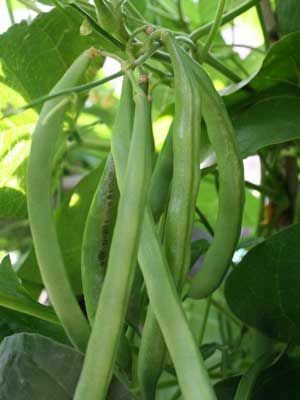 During very hot weather, pole beans may temporarily stop producing new flowers and pods.